A significant number of Christians are now wondering about the moral implications of the Obama health care overhaul. While any number of moral questions will demand attention, the question of abortion stands at the center of concern. And with the question of abortion comes the question of taxes. Without the legislative remedy of the Hyde Amendment or similar protections, it is almost certain that the new health care legislation will lead to tax-supported abortions. At the very least, the legislation will lead to either direct or indirect tax-payer supported subsidies for some abortions. At the extreme, it could mean outright coverage of abortion services. 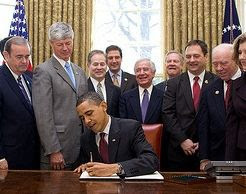 Though President Obama’s Executive Order offers some limitations on tax-payer support for abortion, both sides in the abortion debate recognize that his order cannot take precedence over statute, can easily be removed by a court, and does not cover all arenas in which abortions will be provided or subsidized. The relationship of the Christian to the secular government is fraught with moral questions. Nevertheless, even though the New Testament does not offer a complete primer for Christian citizens on all matters of politics and policy, it does contain clear affirmations to which all faithful believers are obligated. This command was originally issued to the young church that was fighting for the faith in the capital city of the Roman Empire. The New Testament clearly affirms that the presence of a functioning government is one of God’s gifts to his human creatures, leading to peacefulness, rightful order, and human flourishing. The absence of a functioning civil government is a disaster and a curse to humanity. Paul here affirms that Christians are to be found subject to the government - even to the government of Rome. The background to this is the sovereignty of God over all things. God retains his absolute sovereignty, but he delegates some degree of rightful sovereignty to human rulers, governments, and institutions who are, in return, accountable to him and judged by him. God has ordained government and invested it with rightful authority. One who defies the authority of the government thus runs the risk of defying God’s own authority. Clearly, this command has limits. Daniel and the faithful Jewish youths were honored for refusing to bend the knee to a king who set himself up as God. They refused a command that involved the performance of an idolatrous act. They did not launch a tax revolt. To the Romans, Paul was clear - they should pay their taxes. “Render to all what is due them: tax to whom tax is due; custom to whom custom; fear to whom fear; honor to whom honor.” (Romans 13:7) In the previous verse, Paul had reminded the Roman Christians that they pay their taxes out of the fear of God’s judgment and the operation of the Christian conscience. A similar message comes from Peter, who wrote: “Submit yourselves for the Lord’s sake to every human institution, whether to a king as the one in authority, or to governors as sent by him for the punishment of evildoers and the praise of those who do right.” (1 Peter 2:13-14) By such faithful acts, Christians “may silence the ignorance of foolish men” and be found as good citizens. Without doubt, the payment of taxes to Rome would involve the subsidy of acts and policies the early Christians would have known to be morally repugnant and wrong. Nevertheless, the believers were commanded to pay their taxes as an act of their own accountability and faithfulness to God. They would give an answer for their rightful obedience to the lawful authority of the government to tax. The rulers will eventually answer to God for their use of those funds. Jesus spoke these words even as He had been challenged by a strange coalition of Pharisees and Herodians, who were attempting to lure Jesus into a trap. The payment of taxes was contorted into a question of lawful authority and the rightful determination of that authority. Jesus answered their question in a way that left his opponents speechless and amazed. “Give Caesar what belongs to him,” is the effect of Jesus’ words. Caesar does not own their souls - which bear the image of God - and he has no ultimate claim upon them. But, a quick look at the coin reveals that it is Caesar who has his image on the coin. That is a small thing, Jesus implies. Give Caesar back his coin. As Pheme Perkins explains, the issue of taxes in the New Testament emerged in “a political and social context in which taxation was a sign of subordination and oppression.”  Add to this the graft and corruption almost universally associated with the tax franchise in the ancient world. Even so, Jesus’ instruction is clear - Render to Caesar that which is Caesar’s. With the power to govern comes the power to tax, and government is a divinely-ordained institution. Christians are commanded to pay taxes, and were commanded by Christ and the apostles to pay taxes even to a pagan government involved in immoral and ungodly policies - including the oppression of the Jews and the nation of Israel. Thus, the question of paying taxes after Obamacare is put in its proper perspective. We cannot and must not bend the knee to Caesar, accepting the government as our ultimate sovereign. We cannot submit to accept idolatry and idolatrous practices. But paying taxes is a matter of our Christian obligation. There is no Christian mandate against tax avoidance - which is the use of lawful and legitimate measures to limit tax exposure. In other words, Christians are not mandated to seek to maximize their tax bills. But tax evasion is another matter, as is tax resistance. Those who seek by illegitimate and illegal means to resist or evade taxes run into direct confrontation with the commands of Christ and the teaching of the apostles. Abortion is a moral catastrophe. The murder of the unborn is one of the greatest sins any society can tolerate, much less subsidize by taxation. The impact of the new “Obamacare” health care legislation is not yet fully clear, but the legislation lacks any adequate protection for the unborn. Immorality is added to immorality when the power of the government to tax and confiscate the funds of citizens is involved in such a catastrophe. For this reason, Christian citizens should be involved at every level in the political process, seeking to use legitimate means to establish full protection for the unborn and for all other vulnerable persons. Elections have consequences, and this new legislation is a reminder of the power of government to do both good and evil. But to refuse to pay taxes is to deny the legitimacy of the government itself, and to declare it beyond political remedy. Even to Christians suffering under the repressive, murderous, and dictatorial yoke of Rome, Jesus instructed the payment of taxes. Caesar, Christ knew, will one day face the judgment of Almighty God. Rome would one day be brought under his own feet and made subject to him. We do not “render unto Caesar” because of our confidence in Caesar. We render unto Caesar what is Caesar’s, because we are committed with our lives and and confidence and consciences to render unto God that which is God’s. J. C. Doggett, “Taxation,” in New Dictionary of Christian Ethics and Pastoral Theology (InterVarsity Press, 1995), pp. 830-832. Pheme Perkins, “Taxes in the New Testament,” The Journal of Religious Ethics, 12:182-200 (Fall, 1984). Luis E. Lugo, “Caesar’s Coin and the Politics of the Kingdom: A Pluralist Perspective,” in Caesar’s Coin Revisited: Christians and the Limits of Government (Washington, DC: Ethics and Public Policy Center/Grand Rapids: Eerdmans, 1996), pp. 1-22.